I've been lucky enough to make some amazing friends and to meet some pretty wonderful people through writing Coco; I think it's the main reason that I continue to write! I find it fascinating that a few words and some pretty pictures posted on my little corner of the internet have lead me to form friendships that never would have happened had it not been for this blog! Some of my favourite friends are bloggers and it's always lovely to meet people with similar interests. My lovely friend Fi (a friend I've not yet met, but I'm sure one day we'll rectify this) surprised me with a random act of fashion kindness last week. 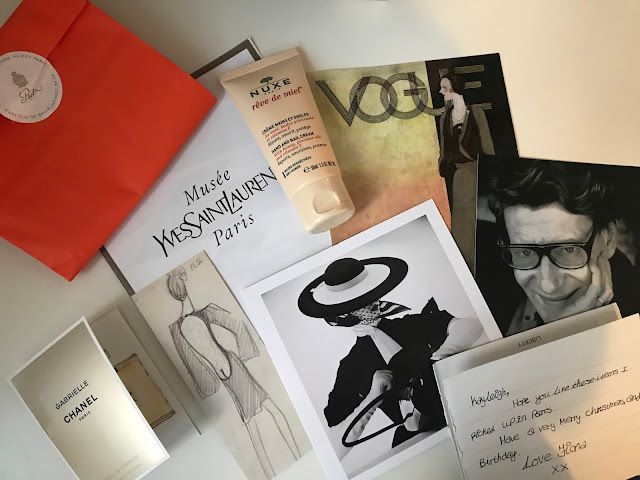 She's just returned from a fabulous holiday in Paris where she visited a Dior exhibition and got to go to the newly opened Musée Yves Saint Laurent, a place that is definitely on my bucket list! Fi and I got to talking mostly via Twitter, where we quite often chat about fashion history and our shared loves of fashion illustration. I was excited to see her photographs of Paris and hear her stories about visiting wonderful places. On her return, she asked for my address, as she'd kindly collected me some goodies during her travels; I was bowled over by her kindness when they arrived! ...and she did! It got me thinking that the world would be a much nicer place if we were all a little bit kinder to each other; kindness is something that I always champion-It's there it just needs to be encouraged. I plan to keep up this tradition of sending bits and pieces through the post; a small gesture can change someone's mindset for the day, all it takes is a little bit of kindness (and it's always nice to receive stuff in the post other than bills and junk mail!!). So lovelies, I encourage you to be kind this December 2nd; maybe there's someone that you could send a little care package to?